For a simple and effective method to keep windows closed permanently, we have a wide range of Casement Fasteners. These products have all been manufactured with durability and style. If you want to monitor how far you keep your sash windows open, then we have Casement Stays, to provide a simple and effective method of regulating how much exposure you want to fresh air. This is especially prevalent during cool weather conditions. Sash windows could be a potential hazard for any buildings that occupy vulnerable people. We have a range of Jackloc Window Restrictors to limit how far windows can be opened to ensure optimum levels of safety for rooms that are situated on a high level. If you want to achieve a traditional finish, then we stock Sash Lifts & Handles. These products have all been made with precision and care from materials like chrome and polished brass. Sash Fasteners are also in sure supply, to provide an architectural vibe for your household. These designs are guaranteed to add strength to sash windows and provide much needed structural integrity. If you have windows that operate on a sliding mechanism, then we have Sash Pulleys. They are mostly suited to traditional rise and fall windows, offering a carry cord to help counter balance the sash weight. These designs work best with two installed at both the top and bottom of any sash window. On our Sash Stops page, we have the 19mm Roller Sash Stop. This product is a solid brass socket screw, which has been manufactured by Fulton and Bray. We offer a variety of finishes, which include; polished chrome, satin chrome, polished brass, PVD nickel and Florentine bronze. We also have Sash Cords, which will easily allow the attachment of sash weights onto windows. They are guaranteed to help maintain balance for any mechanisms that slide in a vertical manner. If you still require further weight balance for you sash windows, then we have Sash Weights. This will ensure that you keep a consistent level of weight distribution for any height you have opened your window. For any windows that are out of reach, we have Fan Light Catches which allow you to open and close windows by hooking a pole onto to a catch. They can also be used for cabinets and doors within households, providing a firm closing method. 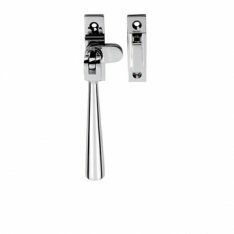 Our range of products are available in polished brass, polished chrome and satin chrome. Finally, we have a selection of Fanlight Stays to allow you to restrict the opening of bottom hung fan lights or casement windows. They also allow you to ensure that windows are only opened to a safe distance.